It may look like an oxidised piece of metal that’ll make your hand smell, but if you can avert your eyes from its rusty outer shell for just a moment, you’ll notice the little connector rearing its shiny head, moving its status from horrible rusty thing to USB drive. But clearly you’re looking because you have a thing for all things steampunk, unique USB sticks, or even rusty objects (you’ll be surprised what does it for some people), right? 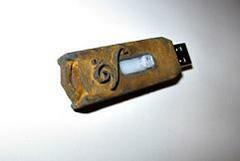 The corroded USB drive is a handmade object with laser cut designs to boot. $40USD will get you 2GB of rusty memory from those purveyors of the handmade at Etsy.